This Giveaway Contest is closed. Thank you. 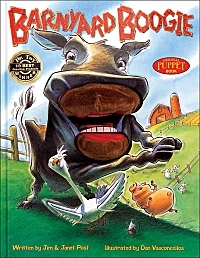 Barnyard Boogie is a storybook that introduces the different farm animals in a fun and playful way. The rhyming and repetitive sentences encourage children to follow and sing along when the adult reads or sings to them. Children love to pretend that they are the different animals living on the farm when they read the book. Furthermore, it has a built in puppet to further engage readers. The puppet is actually a mouth of a donkey, portraying the upper and lower lips. Children and even adults will be amused at how the puppet fit every illustrations each single page, from the farm animals to even the farmer. Every page is so delightful and interesting! No doubt that it will be a fun and interesting story that young preschoolers will enjoy! 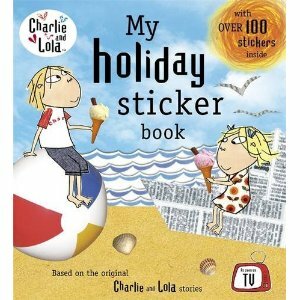 Charlie and Lola: My holiday sticker book is based on the original Charlie and Lola stories as seen on television. This book talks about Lola who is very excited about what she can do during the summer holiday. She fantasizes about going to the beach, climbing the highest mountain, going on space exploration and so on. But… Lola soon realizes that her dreams is not realistic and decides that home is still the best place to be! There are 100 over stickers in the book awaiting your child to create their own holiday dream! Puddle the naughtiest puppy: Magic Carpet Ride talks about Ruby and Harry who were staying at grandad’s cottage when they met Puddle the puppy. Puddle made a mess in the house and pretended to be flying with grandad’s old Persian rug. Both cousins were having fun with Puddle when they realized they were no longer at grandad’s village anymore. In fact, they were at a magical kingdom where carpets were flying everywhere! Soon they were in a Magical carpet race as they set to win the race. Will they really win the race? What other amazing encounters will they meet in this magical kingdom adventure? Readers will enjoy embarking on this magical adventure with Puddle the puppy, Ruby and Harry! 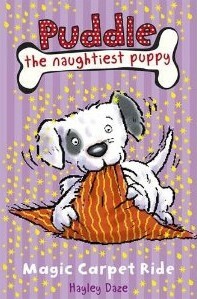 Puddle the naughtiest puppy: Magic Carpet Ride is the first book being published in the Puddle the Naughtiest Puppy series. Check out the other books too! 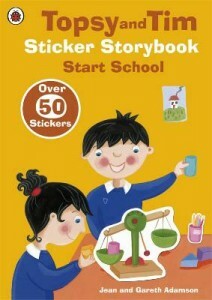 Topsy and Tim Sticker Storybook: Start School is a sticker book that focuses on the school context. This book talks about Topsy and Tim, the twins who were going to school on the first day. It clearly illustrated the relevant events and situations that happen in school, how both children embark on an exciting and amazing day in school filled with fun activities, meeting old friends and knowing more new friends. It is definitely a helpful book to prepare children for school and also for children transiting to new classes. Children can anticipate what to expect from the routine when they go to school. With over 50 stickers and 3 different activities to engage young readers, it will definitely make reading more fun for these readers. Baby Touch: Tickly Tiger Rattle Book is a very interactive touch-and-feel rattle book that attracts and engages young children’s interests. This book introduces different animals in a light-hearted and fun way for the comprehension of young children. Illustrations were colourful and attractive, which will perfectly helpful to capture children’s interest and attention. Some parts of the animal body are made of tactile material that children can feel and explore. Furthermore, young children will also enjoy hearing the build-in rattle. A book that will stimulates and engages the young ones’ senses. Closing Date is 15 July 2010.